Thanks for joining me today for a new share of a project I made for my recent craft fairs. I saw this fabulous ideas on a Stampin’ Up! demonstrator only Facebook group – but I can’t find it again, to tell you who made it! It uses the Home Sweet Home Thinlits Dies, and the coordinating Sweet Home stamp set. You can still get the Bundle (stamps & thinlits) at the discounted bundle price – 10% off – but you have to hurry, and order them before Dec. 21st! After that, the stamp sets are ‘while supplies last’ only. Isn’t’ this a cute idea?! 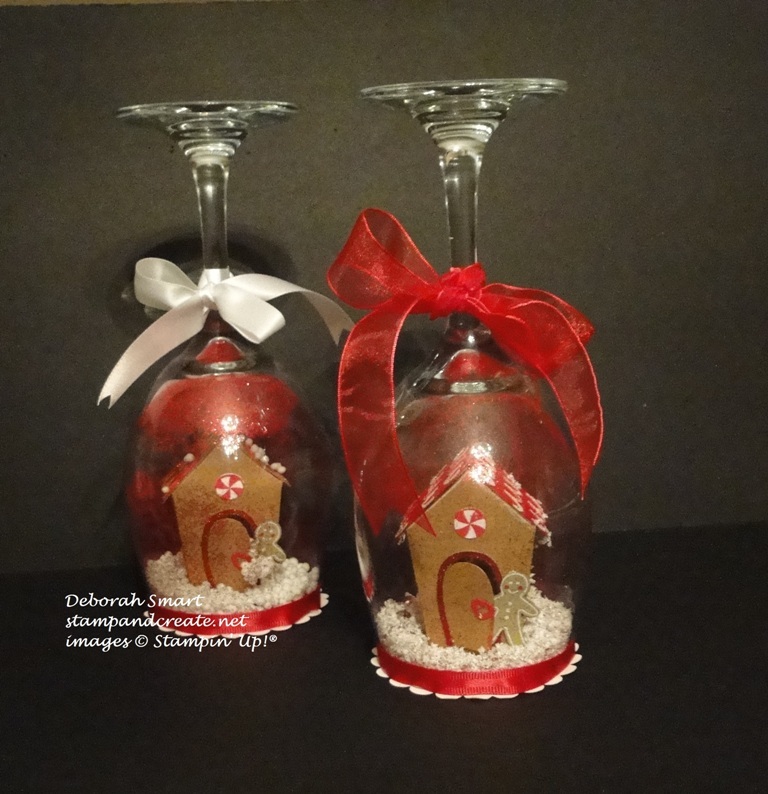 I bought some large wine glasses from the dollar store – I took one of my Home Sweet Home houses with me to the store, to make sure they would fit inside – then assembled the houses in the wine glass! Okay, it’s not quite as intriguing as the ‘ship in a bottle’, but I think it’s a cute take on the traditional snow globe. First, I used the Home Sweet Home Thinlits Dies and the Sweet Home stamp set to create and assemble my houses. I hand cut the little gingerbread man from the Candy Cane Lane Designer Series Paper; he’s more to scale with the house, than the Cookie Cutter Punch gingerbread man. Then, I die cut the largest scallop oval from Thick Whisper White cardstock, and attached my house in the middle. 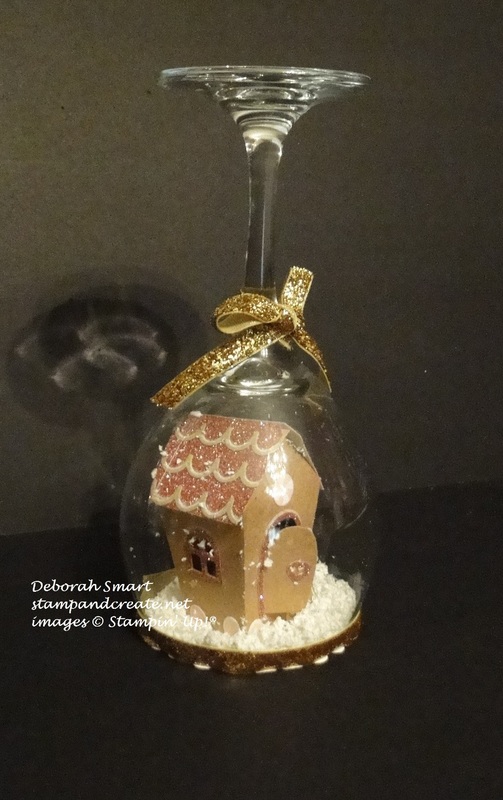 I used our Tear & Tape, as I didn’t want the house falling over if the glass is shaken (like a snow globe). With the wine glass the correct way up, I added some ‘snow’ that I had bought at the dollar store as well; I actually played around with different ‘fillings’ for the snow – I added our white flakes from the Mica Flakes Trio Pack, I added sequins from our Fancy Frost Sequins, and in some glasses, I added some of the Glitter Stampin’ Emboss Powder in Red. What I noticed with the emboss powder, though, was that even when shaken with the ‘snow’, it still stuck to the bottom of the glass (which becomes the top). Using E6000 glue (specialty glue for glass, wood, etc), I ran a line of the glue around the rim of the glass, then inserted the house & bottom into the glass, pressing the scallop cardstock against the adhesive. I left them sitting that way for about 1/2 hour, to make sure the E6000 glue was dry. After flipping the glass upside down, I gave it a shake to mix up the ‘snow’ filling, then added a band of ribbon around the bottom, and tied a bow at the join of the bowl and stem. Here are some more pictures; I did some different colours of houses and bows. Pardon some of the pictures -they were taken at one of the craft fairs after I set up, so they’re not perfect pictures! These are 2 red & Kraft paper houses, with red and white ribbons. 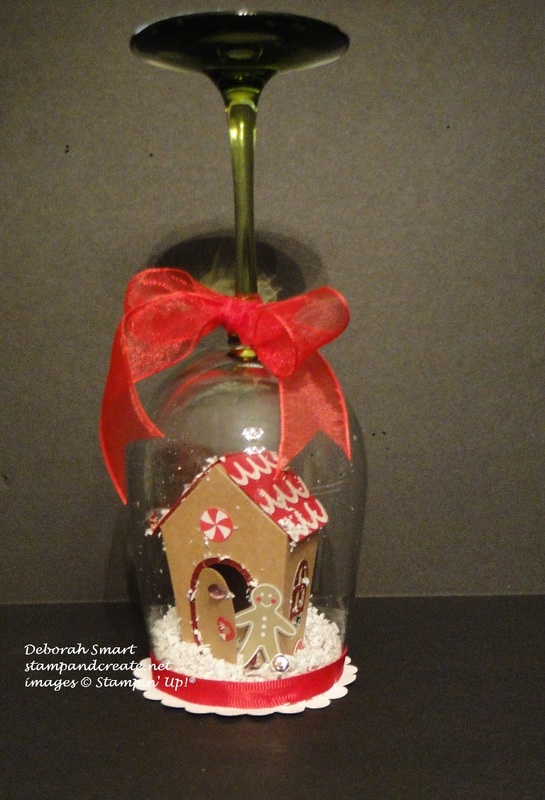 These were fun to make, and I think they’d make a cute hostess gift. I know one lady really liked them – she bought 3 at the fair. The good news is that you can still get the Sweet Home Bundle – it’s not retiring, but if you don’t purchase the Bundle (which you get at a 10% discount from buying the stamps and Thinlits separately) before January 3rd, you’ll have to pay full price for each piece individually after January 3rd. Thanks for spending some time with me today; I hope you enjoyed my projects, and got some inspiration for your own crafting and stamping! We’re having a ‘snow day’ here – it snowed quite a lot yesterday and the beginning of the week, so I postponed my Holly Jolly Stamp-a-Stack that was supposed to take place today. The roads are just a mess to drive on, and I didn’t want anyone getting into an accident trying to make it here! These are adorable! What a cute gift idea! Super cute, Deb! My favorite is the last one. Hope your craft fairs are going well! Love these Deb! Those houses fit perfectly. who knew!